InfoComm 2013 is just around the corner! Mersive will demo the new version of Solstice (1.1) which releases on June 11. Come visit us in booth #4559 June 12-14 in Orlando. Three key new features include: the addition of Android devices to Solstice’s supported clients; the highly-anticipated Podium Mode, which gives meeting presenters, moderators and teachers new controls for Solstice sessions; and the ability to integrate with external video sources, such as video conferencing equipment, Blu-ray players, live camera feeds, etc. 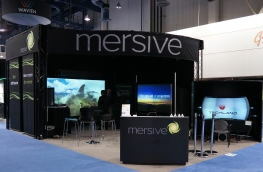 If you want to schedule a meeting with the Mersive team during the event, please contact Erin Brown. Managing and integrating personal devices like smartphones, tablets and laptops into the conference room setting is a very hot topic in the AV industry. The Projection Summit, which is held in conjunction with InfoComm, will include a BYOD Collaboration panel at 10:30 am on Monday, June 10 in room W414 A-B. Mersive Founder and CTO, Christopher Jaynes, will share some of his knowledge about the topic of visual collaboration and provide a demo of Solstice software. Barco and TideBreak will also participate in the panel and discuss their collaboration products. This is an excellent opportunity for people to see these products side-by-side and compare the features of each. You can register for the Projection Summit here. The merger of audio visual communications with information technologies has been happening for several years as more AV tools have IT attributes associated with them. Mersive Founder and CTO, Christopher Jaynes has been speaking on this topic for several years now and will speak on the panel at the IMCCA session entitled “The Merger of AV and IT – What Works? What doesn’t?” If you are an IMCCA member and attending the event, be sure to attend this session on Wednesday, June 12 from 8 a.m. to 10 a.m. in room 315A of the Orange County Convention Center.